Bahrain riot police have fired tear gas and stun grenades at Shia protesters who threw petrol bombs during a demonstration against Sunday’s Formula 1 race, witnesses told AFP. Officers have arrested several people accused of stealing and burning cars. Protesters shouted "your race is a crime" as they marched through the streets of Shia districts. Graffiti on nearby walls read, “No F1. Don’t race on our blood.” Bahrain's main opposition bloc has called for peaceful pro-democracy demonstrations to be stepped up before the race. 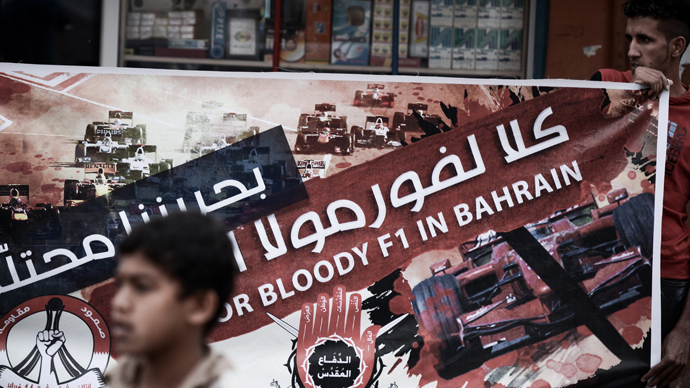 "There are many protests against Formula 1 in Bahrain. They have blocked the roads which lead to the F1, as well as roads close to the American base and the bridge between the airport and the capital Manama," Acting Vice President of the Bahrain Center for Human Rights, Yousif Almuhafdah, told RT. The February 14 Revolution Youth Coalition, a cyber group that organizes protesters, boasted on its Twitter account that people took to the streets with "a steel will." The group added that people were "imposing a different rhythm in the street, in the first round of Volcanos of Flames" - referring to the name they have given to a week of demonstrations against the F1 race. The motorsports event has been seen as a chance for the opposition to draw attention to its pro-democracy campaign. “We will continue to peacefully protest and we will get our democracy. 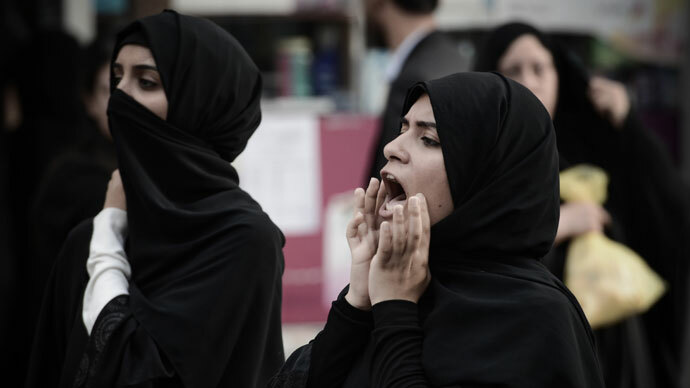 I know it is complicated...but Bahraini people are strong, struggling, fighting for democracy, and they will not give up,” Almuhafdah said. The country’s state news agency said late Wednesday that authorities arrested a man who later confessed to a car-burning incident. 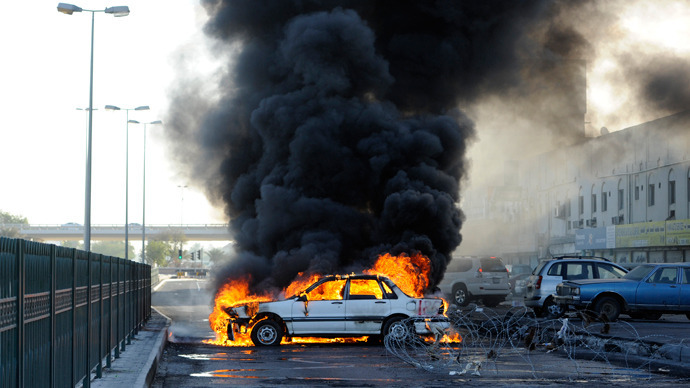 The vehicle exploded in Bahrain’s financial district on April 14. Four other people were arrested for allegedly stealing and burning a car near a roundabout. An additional person was detained over an accusation that he blocked a main road and caused damage to another person’s car. Human rights activists have claimed dozens of anti-government protesters have been arrested prior to the race, according to Amnesty International. “We are seeing nothing but crackdowns and token gestures to clean up the country’s image,” Amnesty International’s Middle East and North Africa Program deputy director, Hassiba Hadj Sahraoui, said in a Wednesday statement. 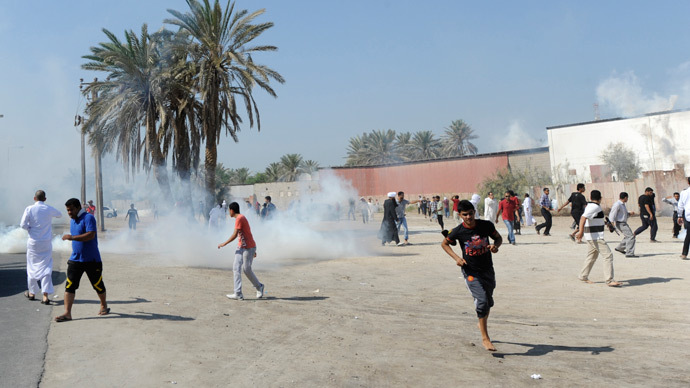 Human Rights Watch said last week that police had arrested 20 opposition activists in towns near the F1 circuit. The organization claimed the arrests were made with the intention of preventing a repeat of the 2012 F1 protests. Last year’s race went ahead against a backdrop of burning tires and riot police firing teargas at protesters throwing petrol bombs in Shia Muslim villages. 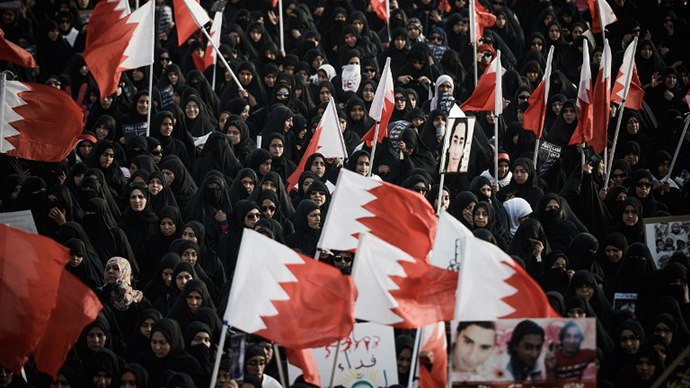 The 2011 Bahrain race was canceled when protests were crushed and at least 35 people were killed. Bahrain, which hosts the US Navy’s Fifth Fleet, has been hit by unrest since pro-democracy protests broke out in early 2011. The Gulf Arab state is ruled by a Sunni monarchy, although over 75 per cent of the population is Shia. Activists are demanding democratic reforms and an elected government. 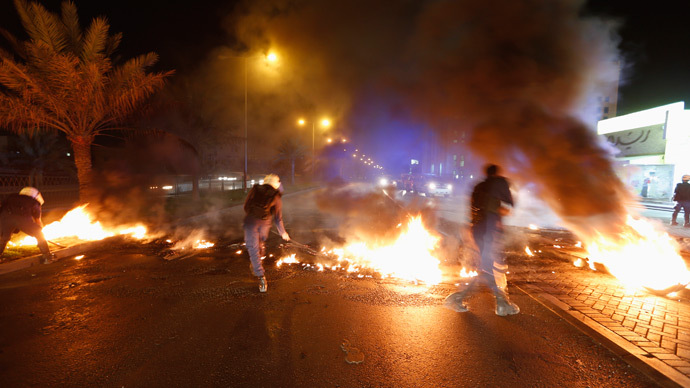 At least 82 people have been killed and thousands arrested since the unrest began. Many opposition figures have been detained on the allegation of planning to topple the government. The Formula 1 Grand Prix, which will be watched by millions around the world, is the biggest sporting event hosted by the US-allied country.